Discussion in 'MOC 2019 Challenges' started by Sokee, Jan 24, 2019. MOC is one of those treasures that I would just love to stick in my pocket so at a later time I might find myself pulling it out, and for me it would be a reminder of that year I myself completed MOC and then became a Polly! I like to think of this challenge in that way. Have you ever found your self taking a walk and see a smooth rock that makes you stop in your tracks, you bend over and pick it up rubbing it between your fingers, that feeling of a treasure you just found, and you slip it into your pocket for safe keeping. For this challenge I would like you to use this Pocket Template and fill it with whatever you would like to treasure OR maybe it is journaling a hard time you are trying to get through or a heartbreak you’re trying to get over. This Pocket is a safe place to put them. 1. With this challenge you MUST USE the Pocket Template provided. You may use the Template to make your own Pocket or use the pre-made pieces in your download, but it must be a pocket. The Pocket must be recognizable on your completed layout. 2. You must put at least ONE item inside your pocket. 3. The choice is yours on this challenge if you add a photo, but it is not required. 1. 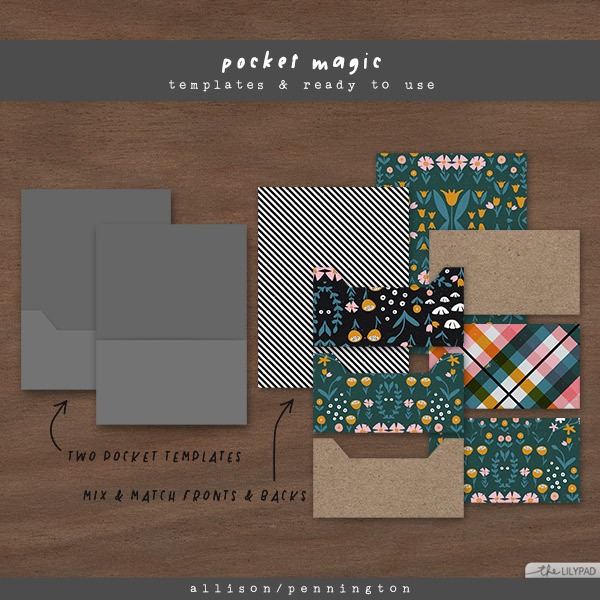 Create a layout using the pocket template provided. You may use the Template to make your own Pocket or use pre-made pieces in your download but it must be a pocket. 3. Including a photo on your layout is optional. Post your layout in this thread. People can comment here if they wish. crazsquaw, Karen, Ferdy and 7 others like this. 1.Do we need to use the patterned pieces as well or can we just use the template with our choice of kits? You do not need to use the patterned pieces, you can use the template and use your own Lily Pad Paper! If you look at my layout I used a Journal Card for the back of the pocket. Using the Template. 2.Can we use the pocket in a pocket style layout with multiple pictures or do you want the layout to include only the pocket with the thing we choose inside? You can do any style layout you would like! BUT you must use the Pocket provided for this challenge somewhere on your layout, and I must be able to see it and recognize the pocket. 3. Can this be a Hybrid? Heck Yah!!!! As long as I see you printed and used the POCKET you are good to go! 4. Can we use the pocket more then once on our page, like fill more then one with treasures? YES! You can put as many pockets on your page that you want! BUT each pocket must have at least one item in it. 5. Can I use a style on my pocket? Yes! As long as we can see Allison's pocket was used! Thanks Karen, excited to see what you create! Do we need to use the patterned pieces as well or can we just use the template with our choice of kits? ohhh I'm excited for this one. Already have an idea. Now to wait until the kids are napping so I can scrap. Another creative challenge! This has been the most exciting MOC ever!! Every challenge has been so inventive and creative! This will be yet another FUN one to do!!! blueberries, chigirl, Sokee and 1 other person like this. You do not need to use the patterned pieces, you can use the template and use your own Lily Pad Paper! Glad you like it! Looking forward to seeing your layout! Thanks Glad you like it too! Excited to see your layout also! I know! MOC is my favorite month here! Sani_digiscrap, rrred68, lulyg14 and 14 others like this. Yes for kids napping!!!! How many do you have? I have 3 kids of my own (10yrs, 7 yrs and 1.5 yrs) but I also run a home daycare. Today I have 3 daycare kids - plus my own 1.5 yr old. The 2 hour nap time is my daily scrapping time. Lisa B, Dalis and Sokee like this. So that means you are busy! I have 6 children but they are grown. Our baby still lives at home but he is almost 20 which = never home. We have 2 married. One engaged. If you look at my layouts you will see we have one grandchild. Zoey. Enjoy your children while they are little. I never realized how fast those years go until they are grown and gone. Frumpje and Miss Becki... like this. @Sokee Can we use the pocket in a pocket style layout with multiple pictures or do you want the layout to include only the pocket with the thing we choose inside? Thanks! Cool challenge! Can say I have maybe used a pocket once. This should be fun and I agree with @NancyP this moc has been unique ! When you said pocket I expected to read and do a filled template in my preferred style..instead yet another complely newish thing to me and this is cool!!! Sokee and KarenB like this. AllisonPennington, Dalis, KittyY and 3 others like this.